Other names for Alpha Pharma Induject-250 are Sustanon, Sustaver, Sustamed, Sustaretard. The effects of four different testosterone esters are combined in this preparation. It is used if the body is unable to produce its own hormone in sufficient quantities, and is very popular in sports pharmacology. The drug is convenient low frequency of injections, with its sufficient effectiveness. It has a high anabolic and androgenic activity, has no adverse effect on the liver and does not manifest itself in doping control. It allows you to quickly gain muscle mass and increase strength, increases appetite and sexual desire. The usual course duration is 6-8 weeks. Injections are made once a week with maintenance therapy, at a dosage of 250 to 500 mg. If you need to extend the course, doctors recommend including gonadotropin in it. Also for a set of muscle mass, the combination of Sustanon with Nandrolone has proven itself well, and Winstrol additionally contributes to the drying and relief set. Do not forget to consult your doctor for the selection of the correct steroid complex. This will save you from side effects and provide a more pronounced effect. In addition, like any other drug, Sustanon is recommended to be combined with proper sports nutrition. 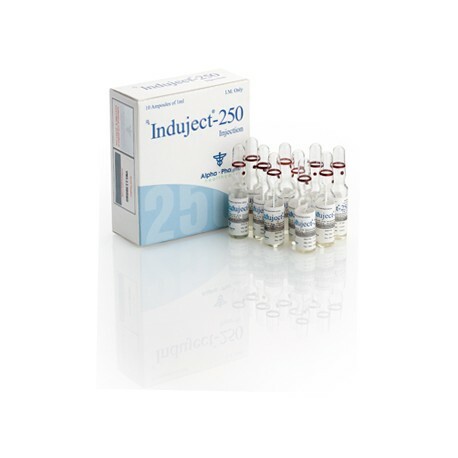 Induject-250 can not take young athletes under the age of majority. In addition, due to estrogenic activity, while taking the drug, gynecomastia may cause other negative effects on hormonal background. It is inhibited by aromatase inhibitors and other angiestrogens. With long-term use of Induject-250, testicular atrophy may develop, so be sure to consult with your doctor about the duration of the course and the parallel intake of other hormones. However, if you follow the instructions for use, all negative manifestations can be avoided. Buy only effective drugs from trusted suppliers!